The Lock-Up has thirteen branches around Japan, with five in Tokyo alone. It’s an izakaya, which means it’s all about drinking, and snacking on the side. 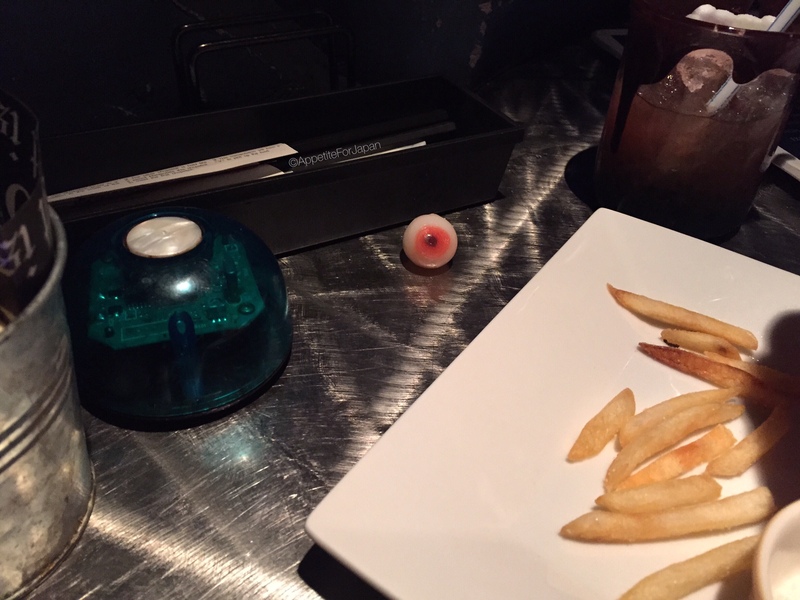 Something that themed izakayas tend to have in common with other themed restaurants is that the alcoholic drinks are not particularly alcoholic. The drinks – like the food – are expensive for what you get, don’t expect to get drunk here without breaking the bank. 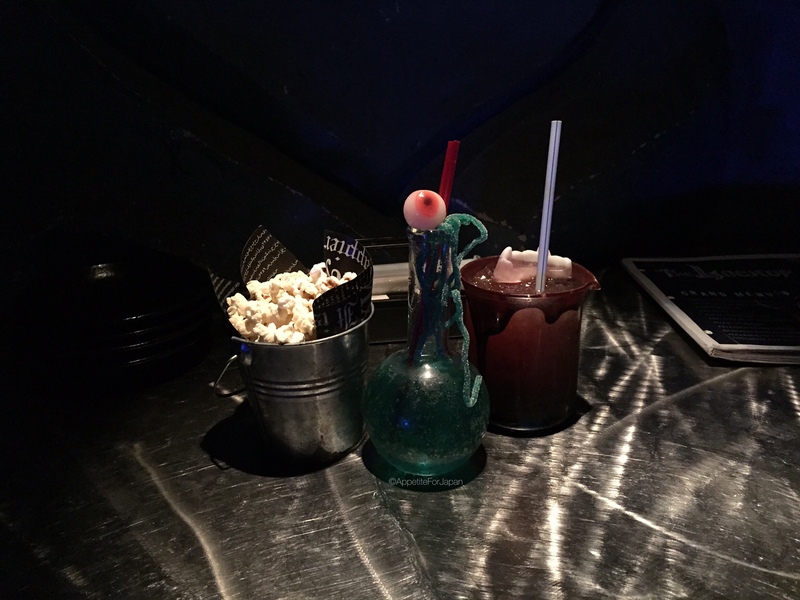 What you can expect is well presented drinks in fitting with the scary theme of The Lock-Up. Whilst the food is nothing special, it’s not bad either. Like the drinks, the food is overpriced, but you’re really paying for the experience of eating at a themed izakaya. There are a couple of options when it comes to visiting The Lock-Up. You can either order each item from the menu individually and pay the full amount, or you can select a course menu and/or an all you can eat/drink package. 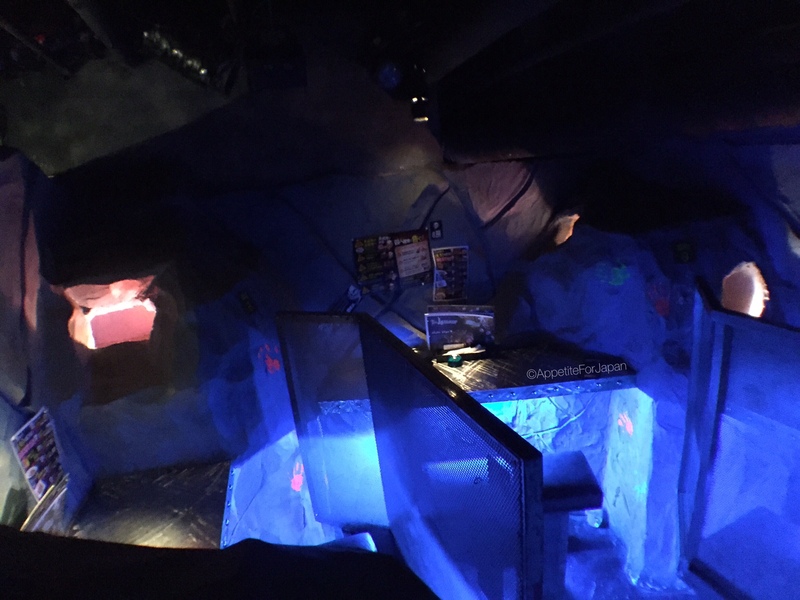 The benefit of the latter is that you’ll be seated in a better location such as a dungeon-type room, and of course at around 4,000 Yen per person, you’ll get better value for money if you’re planning to have several dishes and several drinks. My partner and I opted to pay individually for each drink and snack (they’re definitely more snacks than meals) because we decided to visit both of Shibuya’s jail themed restaurants in the one night, so we knew we wouldn’t be needing too much to eat or drink at each one. Why did we do both in one night? 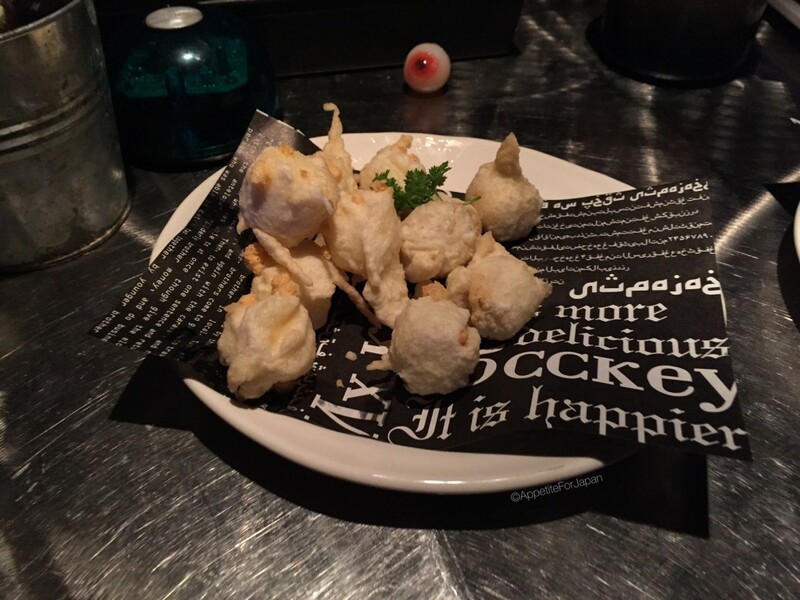 We (read: I) wanted to go to both izakayas, but experience has taught us that themed dining is not always the best quality, and we didn’t want to spend two separate nights on something similar. The izakayas are within ten minutes’ walk of one another, so we made a reservation for The Lock-Up, and then we headed over to Alcatraz ER after that. The Shibuya branch is located under a Village Vanguard store. Take the stairs toward the shop, but keep going down the next flight of stairs. The door to The Lock-Up will probably be shut, so you’ll need to open it to enter. 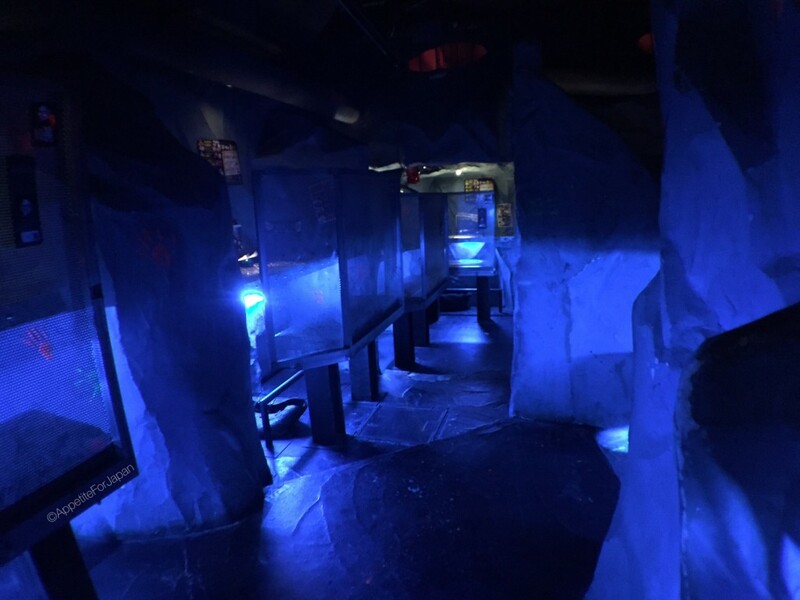 Then you’ll walk through a corridor full of surprises to give you a fright before you eventually stumble into the waiting area of the izakaya. I’ve heard that it gets pretty busy on Friday and Saturday nights, so it’s worth booking ahead or getting there early. We went on a week night AND we booked ahead of time, just to be sure. Since we were in the area the evening before, we went in and made our booking in person. Once your table is ready, a staff member in a police uniform will come and get you. You’ll be asked which of you is guilty (me), what your crime was (I’m not sure why, but murder was the first thing that came to mind), and you’ll be hand-cuffed to the officer and led to your seat. Only one person per group gets hand-cuffed. It’s the same drill for every group of customers. I wanted to take a photo, but sadly The Lock-Up is yet another Japanese eatery that does not allow photos (that being said, it looks like a few other customers have managed to gain permission for a photo). There are plenty of rules at the Lock-Up, including customers being forbidden from wearing costumes that relate to the prison theme (police officers, prisoners, etc). Presumably this is because they don’t want people to confuse other customers for staff members, which is fair enough. For very small groups who are not ordering from one of the course menu plans, there are small benches with bar stools with metal screens behind them. We were the only people in this entire section of the restaurant. I think that actually made it a lot scarier during the ‘scary’ part of our visit, which, if you enjoy being frightened, is probably a good thing. As photos of the staff are not allowed, I don’t have any pictures of what happened halfway through our visit. Sirens and flashing lights came on, and escaped prisoners started running amok. We had a scary clown and someone in a ‘Scream’ mask banging on the metal screen behind out seat. It was surprisingly scary! Eventually the (staff dressed as) police rounded them up and everything returned to normal. I assume that this happens every hour or so, so if you visit The Lock-Up, make sure you stick around for this to get the full Lock-Up experience. We ordered the ‘Interview With The Vampire’ cocktail and the ‘Psychopath Medusa’ cocktail. They cost 650 Yen each, which is not too bad given the presentation. 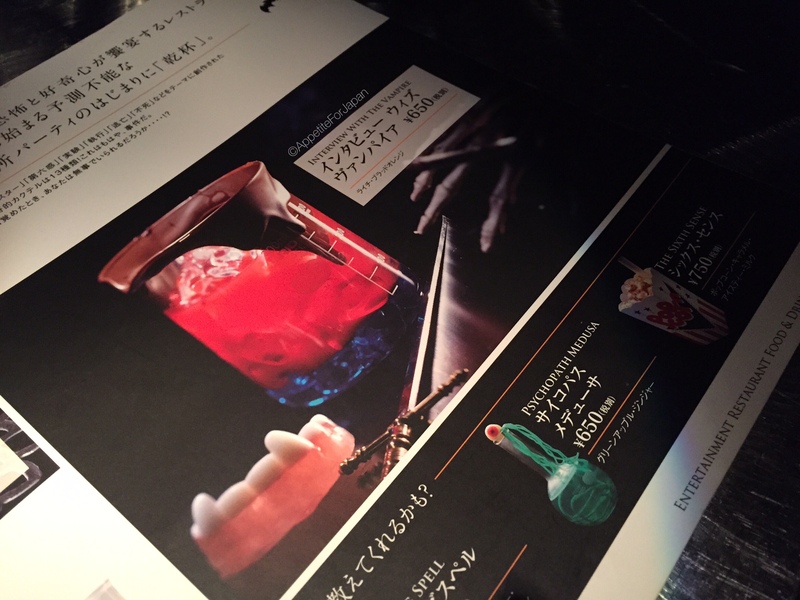 The teeth in the ‘Interview With The Vampire’ cocktail were made of ice. I’m not sure what the beaker and flask have to do with jail – these say ‘science lab’ to me, but hey. The popcorn is one of those “free” snacks that everyone is given, in exchange for the service/table charge that you pay for visiting. Oh yeah, and tax is charged on top of the advertised prices for food and drinks. Both of these are pretty common in Japan. From the food menu, we ordered French fries with truffle salt, some kind of tuna with onion served hot in a can, and deep fried, battered cheese. The fries were much like what you get from McDonald’s, but that’s not necessarily a bad thing. They were cooked in clean oil and the truffle salt was tasty. 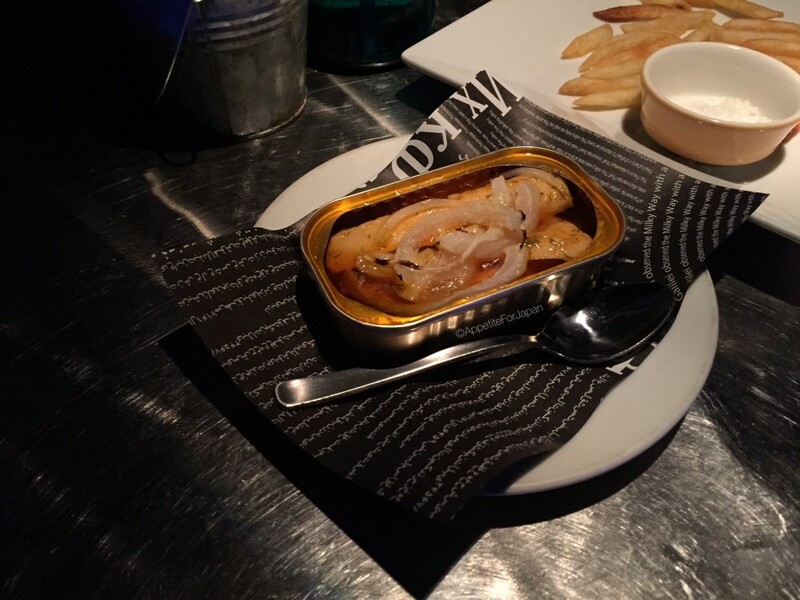 We couldn’t work out whether this was canned tuna with onion or whether they added the onion, but either way, I actually really liked this. My partner was not really a fan of it. Last but not least, the fried cheese balls were okay. Again, they were cooked in clean oil which is good, but the cheese itself was nothing special. 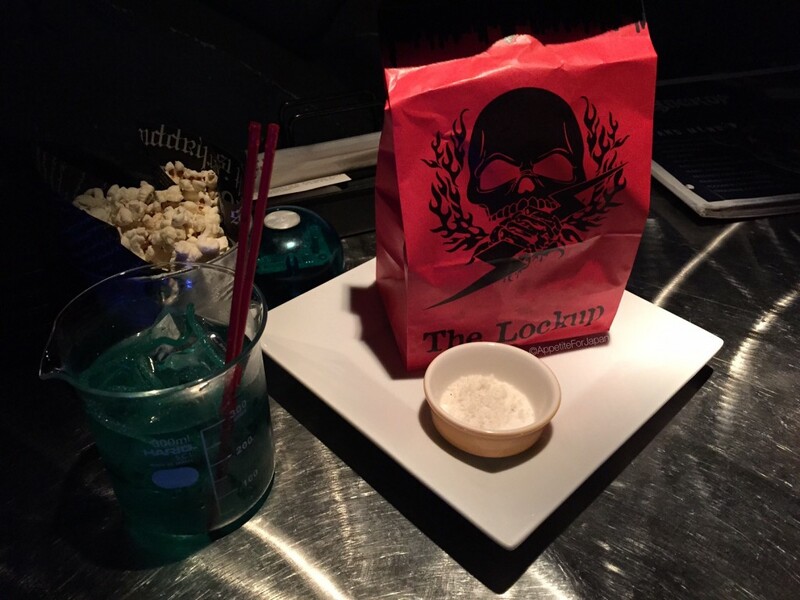 Then again, The Lock-Up is an izakaya; you don’t go to a prison themed izakaya for gourmet food. Would I recommend The Lock-Up? Maybe. 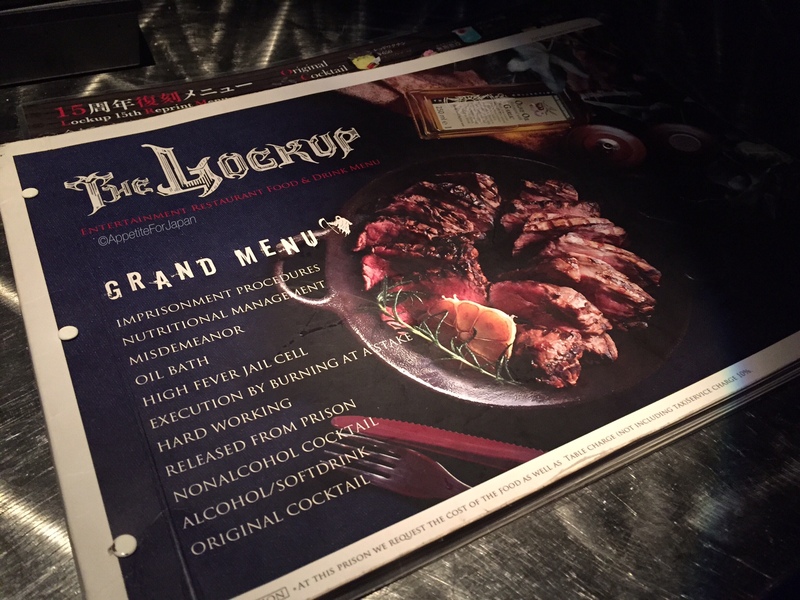 There are many themed eateries to choose from in Tokyo, and if you’re interested in a jail themed izakaya, you have two options in Shibuya alone (The Lock-Up, and jail-hospital themed Alcatraz ER). The Lock-Ups branches are in Shibuya, Shinjuku, Ikebukuro, Ueno and Omiya. Their other branches include Kobe, Osaka, Nagoya, Hiroshima, Fukuoka and Hokkaido, to name a few, so you have plenty of options if you’re thinking of visiting The Lock-Up. 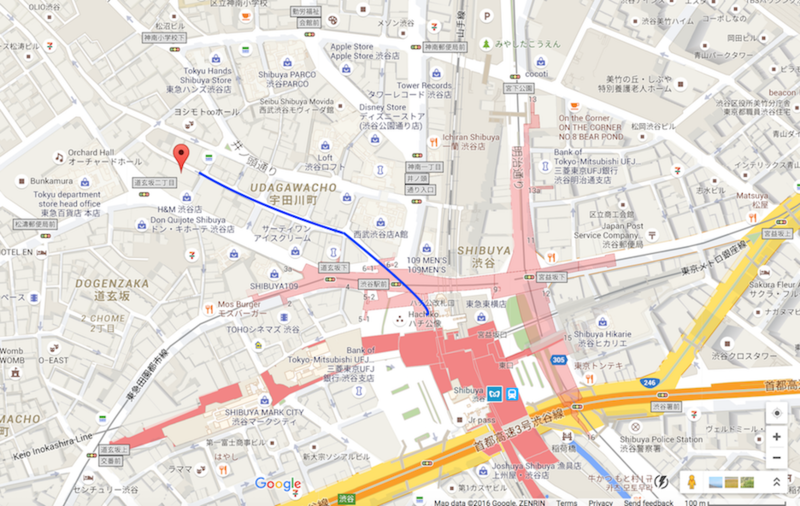 Here is a map with the directions from Shibuya Station to The Lockup (thanks to Google Maps). Exit Shibuya Station via the Hachiko Gate, and cross the road at Shibuya Crossing. Follow the blue line on my map (above) – you’ll almost be walking in a straight line the whole way, just veering slightly to the left halfway. It’s about a five minute walk. 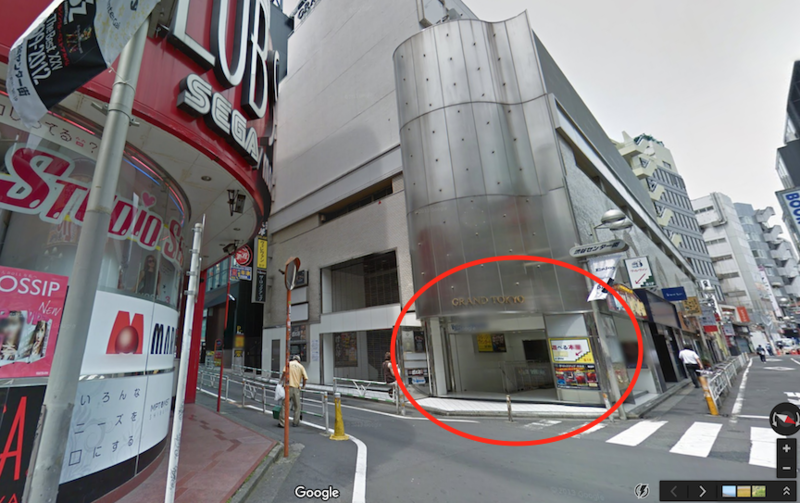 Keep an eye out for the red Club Sega building on the left (you can see it in the above photo) – when you get to this spot, stop and you’ll see a large silver building in front of you, just across a small intersection. 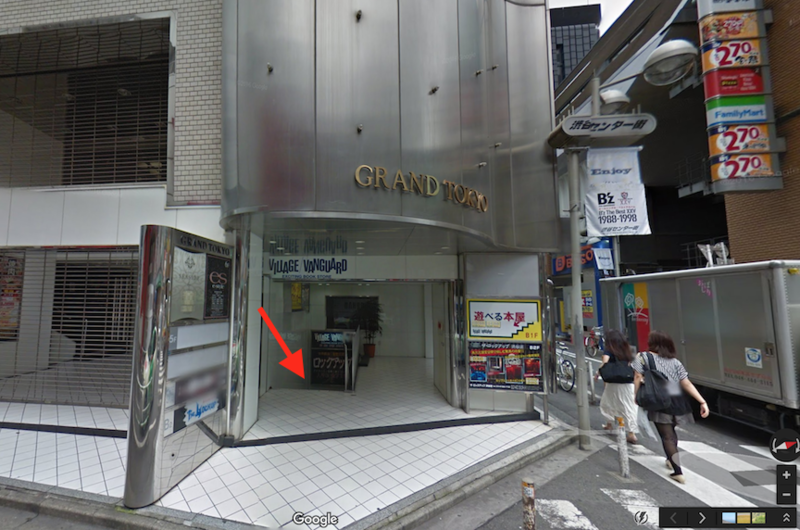 That’s the Grand Tokyo building – I have circled it in red above. At street level, you’ll see a sign and the stairs for the Village Vanguard store (if you look carefully, you’ll also see the sign for The LockUp on the right – it’s not that obvious). Go down the stairs (where I’ve placed the red arrow). At the bottom of the first set of stairs is level B1 – that’s where the Village Vanguard store is. Keep going down the stairs to level B2 and open the door to enter the LockUp. Next up we’ll check out Tokyo’s other prison themed restaurant, the prison-hospital themed Alcatraz ER.